Over the years, I have brought in the cows for milking hundreds of times on the farm. If the sky is clear, I can look right across the Mourne Mountains, see Spelga Dam’s wall and even notice if the overflow is on. This month, I got the opportunity to watch herds of cattle come down the Swiss Alps as part of their annual descent from where they graze during the summer months. This was a very special experience for me as a farmer’s daughter and one I will try and share with you through this blog. 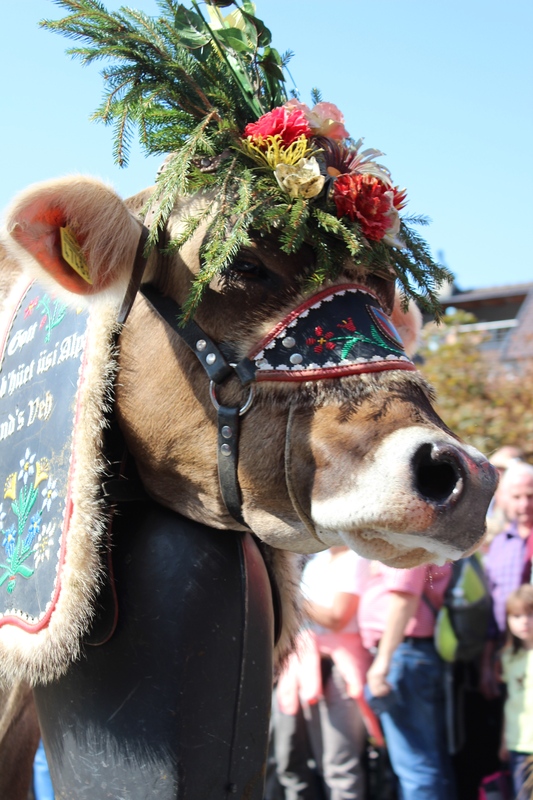 For the past 14 years, an event has taken place on the last Saturday in September in the small rural town of Schüpfheim, in the Canton of Lucerne, Switzerland, as the cattle parade through adorned with flowers, headpieces and their signature cow bells. The sound alone is something else! It is known as the Entlebucher Alpabfahrt. 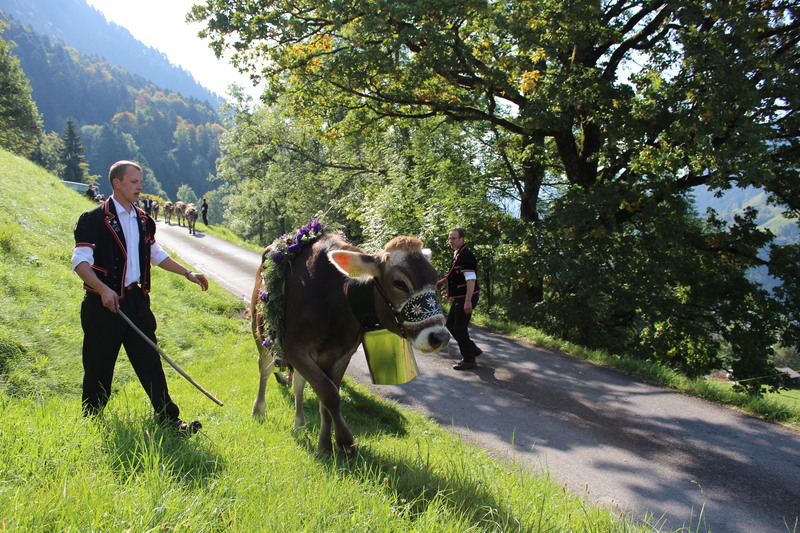 As part of the International Federation of Agricultural Journalists press tour, we got to visit a family preparing their cattle up in the Alps before they walked the 11k down into Schüpfheim. Our minibus took us up the narrow windy road to a forest area beneath one of the Alps. When we arrived at 10.15am, about 20 cattle were tied to tree logs as their owners were power hosing them clean. 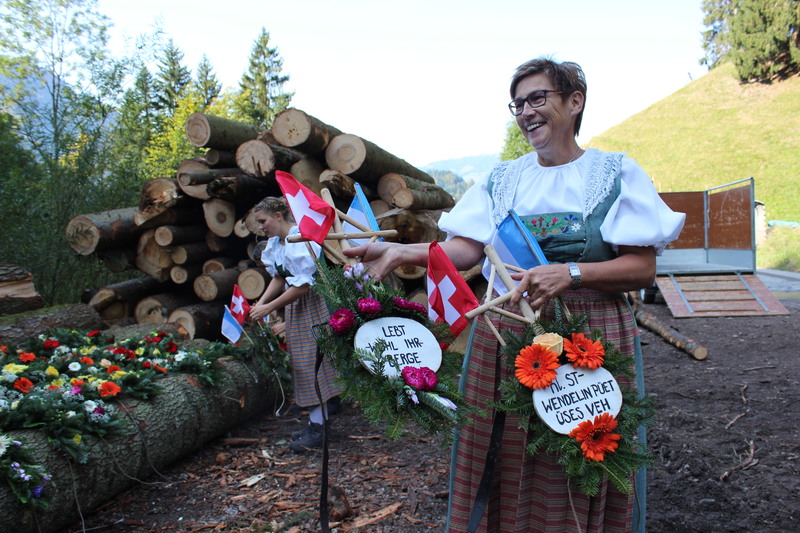 The female family members, wearing traditional Swiss costume teamed with modern hiking boots, brought out beautiful floral arrangements they had carefully prepared the day before from a trailer and set them out on other logs. There were yellow roses mixed with gerbera daisies, purple and white spreads, and orange gerberas mixed with peach roses. As we, the farming paparazzi, snapped away at all the preparations taking place, we could hear in the distance the jingle jangle of a multitude of cow bells. 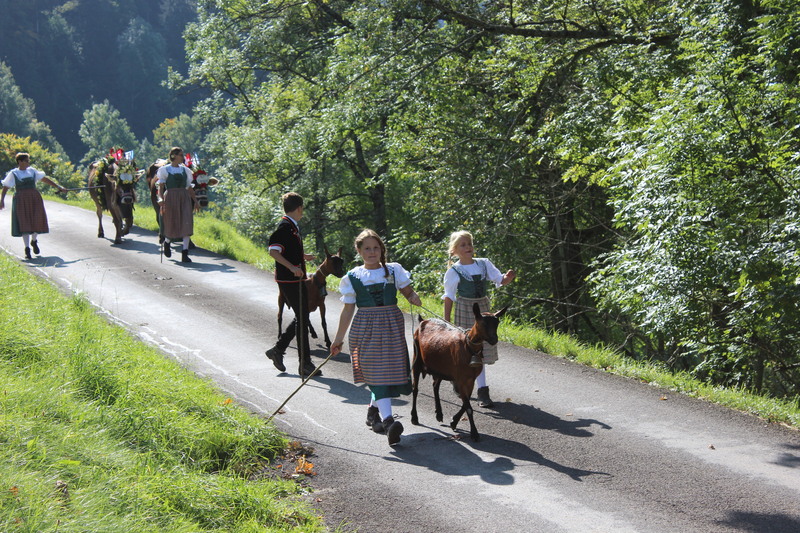 Soon after that, a herd from higher up the Alp came past their contemporaries who were still getting their final touches. 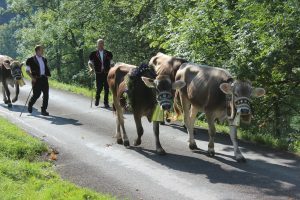 Led by men dressed in smart black velvet waistcoats with a red trim, the herd marched past, harness free, all obediently following the one in front. 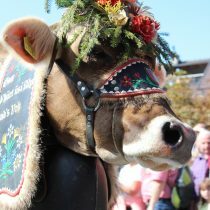 The first 9 cows at the front had the most decoration, bright yellow sunflowers covering both their head and shoulders, whilst the younger animals at the end of the procession just had their bells on. The smiles from the farmers shone with pride. Perhaps this was because we had our cameras and phones out to record this spectacle, but they looked like they were enjoying themselves regardless of our attention! Ten minutes after the last of the animals wound their way down the hairpin in the road, the herd we had watched prepare were now ready to depart. The floral arrangements and tall headpieces were fixed on by the farmers with little or no fuss from their bovine models. I walked further down to get a different angle to photograph this herd from, going round the bend so I could watch the whole descent from the one spot. Earlier, I had posed with 10 year old Ellie and she and another girl now led the herd walking with a brown goat. 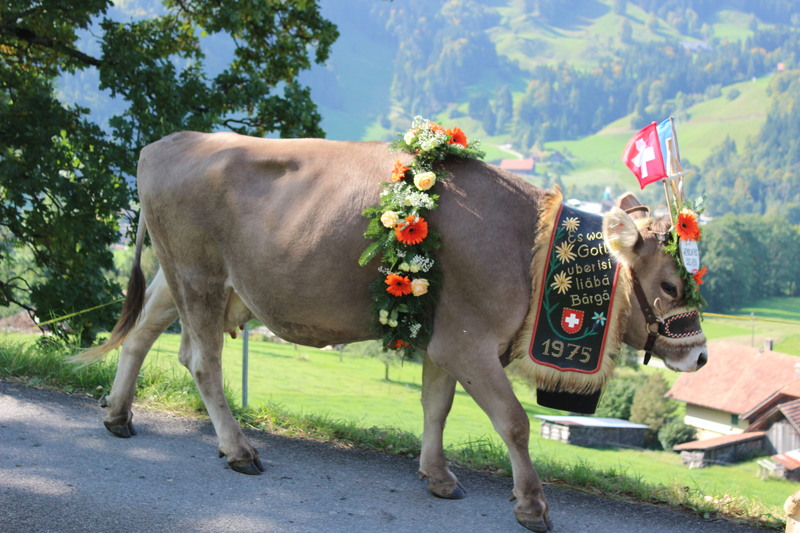 The first cows’ headpieces included the Swiss red flag and also the blue and white flag of the Canton Lucerne. 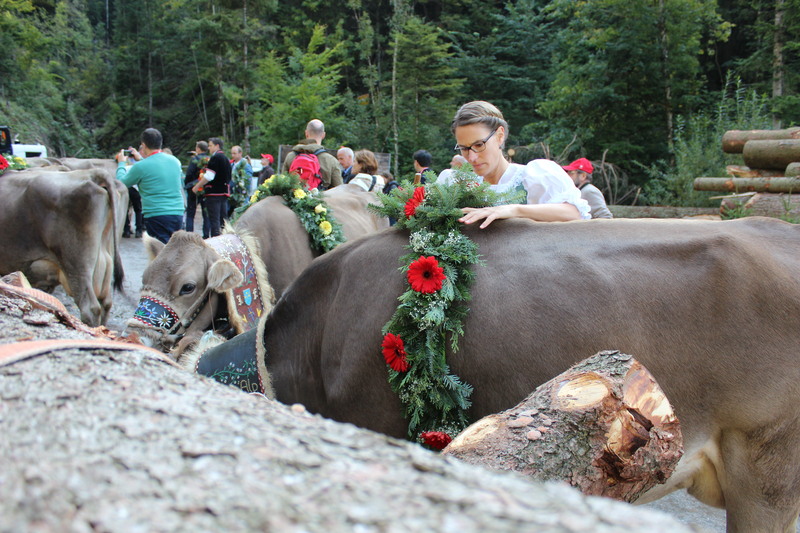 With the backdrop of the forest and the Alps, we enjoyed watching them parade past, some trying to sneak in a bit of grazing to keep them going on their journey to Schüpfheim. 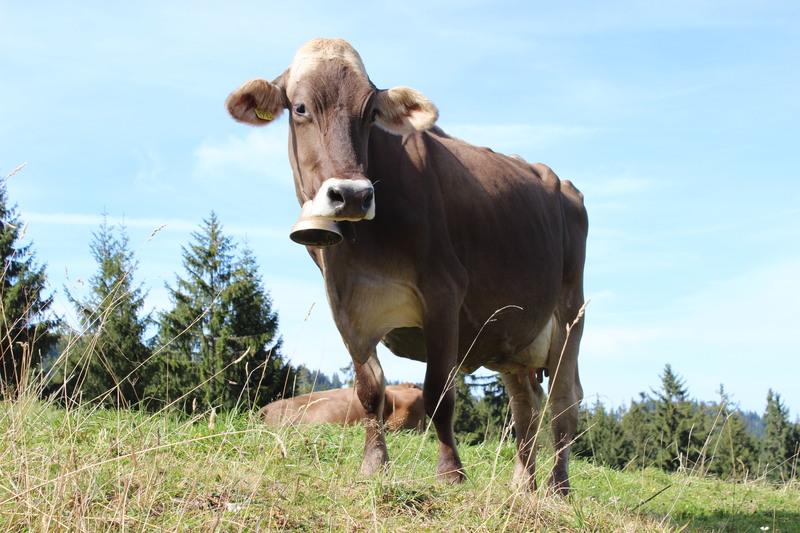 Alpine pastures grow up to 100 different herbs and grasses creating a unique taste in dairy produce. 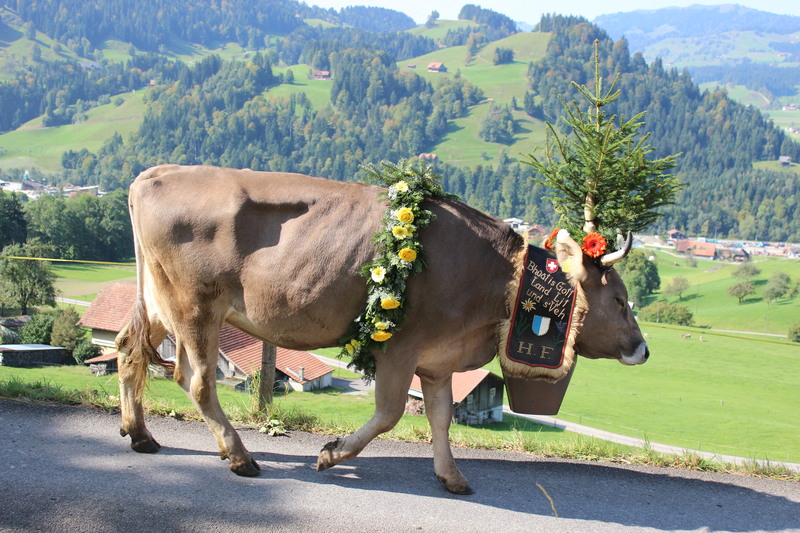 A cheese may only be designated as Alpkäse (alp cheese) if the milk production and cheese-making take place on the Alp itself. As opposed to mountain cheese, alp cheese is a seasonal product which is only produced from May until September. 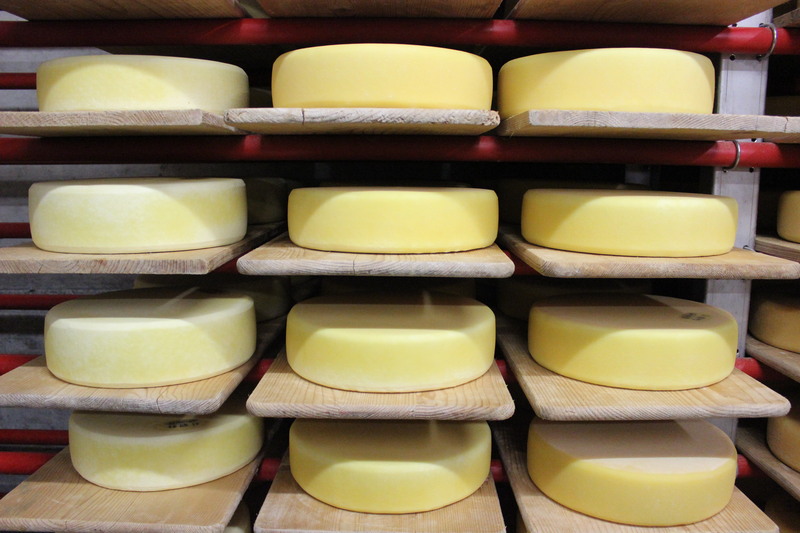 Every year about 5,200 tons of alp cheese are produced in 1,450 different alp cheese dairies in Switzerland. The day before, we had a tour of one based on Alp Abnistetten, 1,250m above sea level. The Theiler family run the farm which has 36 dairy cows and 16 young cattle. In the summer, they turn 650 litres of fresh milk into cheese, butter and cream. 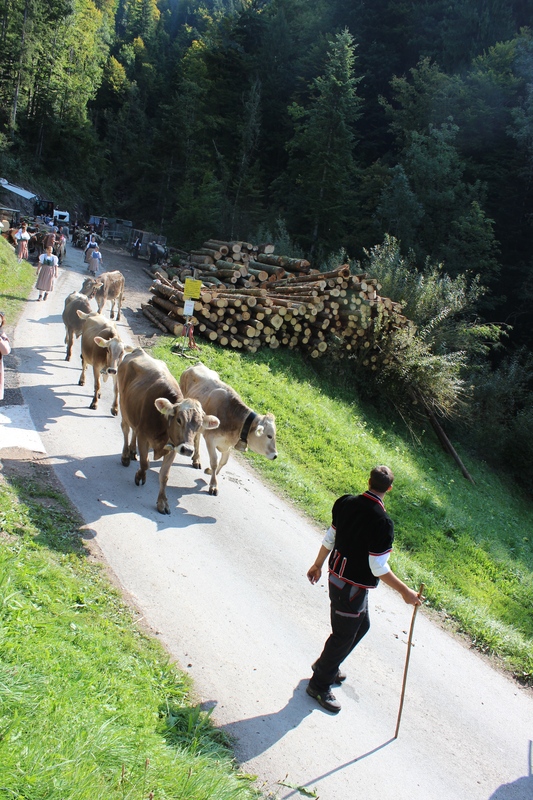 Back to the Alpabfahrt, the other half of the journalists were based down in the village all morning, witnessing all 276 cattle proceed through. After seeing the second herd off, we boarded our mini bus and took a shortcut down to watch the last of the parade. 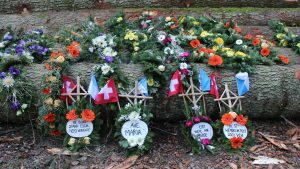 It was only then that we realised how many people had gathered in Schüpfheim, estimated at 12,500 lining the main street. They were 3 and 4 rows deep, young children on top of their daddy’s shoulders to catch a glimpse of the cows coming through in stages. It was interesting to note that there were no barriers, fences or any kind of separation between the public and the cows. 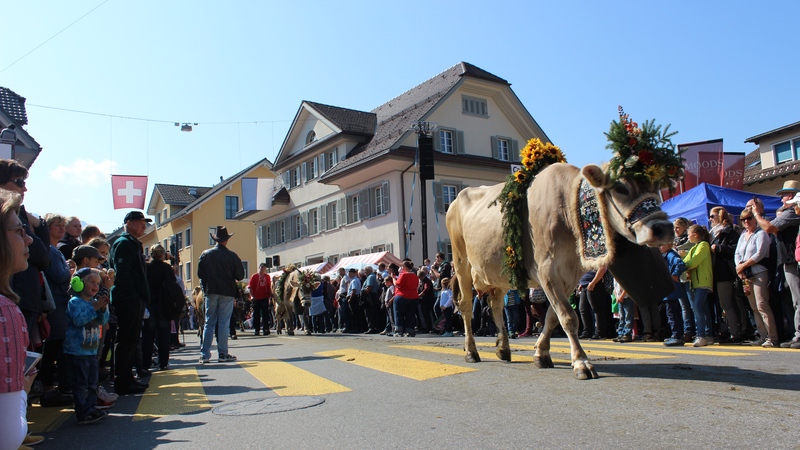 There was a great atmosphere with stalls selling local crafts, wurst (sausage) and of course, cheese! 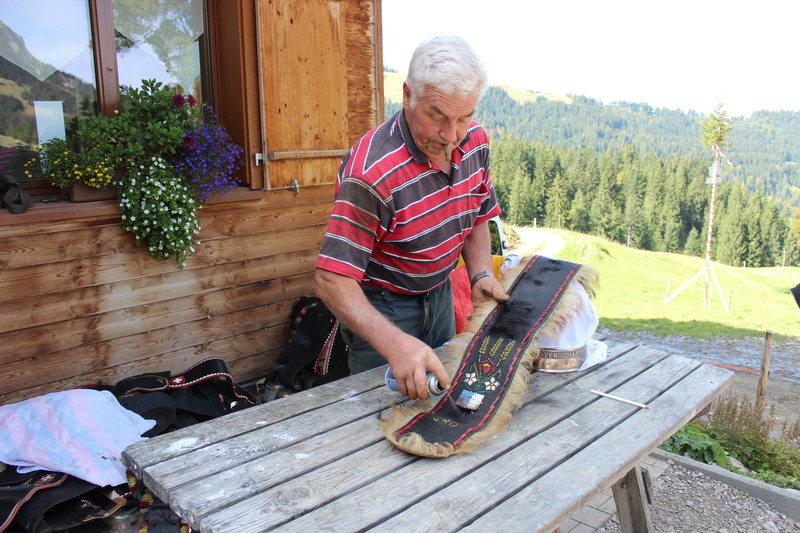 You could even buy your own cow bell to take home, as well as traditional Swiss Edelweiss shirts that we saw farmers wear throughout our four day tour. 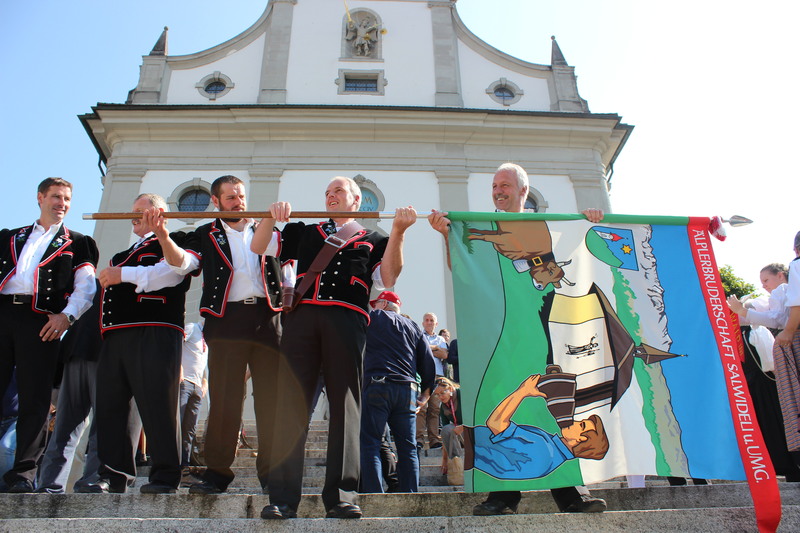 Around 1 o’clock, with all of the cattle down from the 7 different Alps, the crowd headed to the Pfarrkirche Johannes und Paulus (Parish Church) where a large choir had formed on its impressive steps. 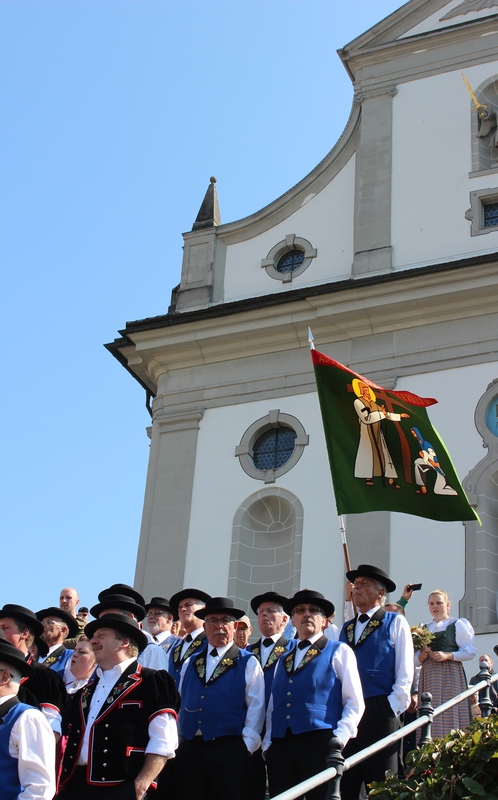 The singing, or yodelling as they like to call it in Switzerland, was simply stunning especially when there were no musically instruments accompanying them. 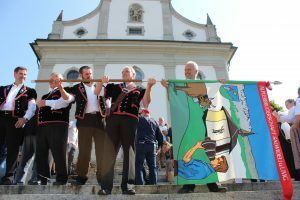 The finale was lead by a group playing alpenhorns or alpine horns – the sound they made was incredibly beautiful. 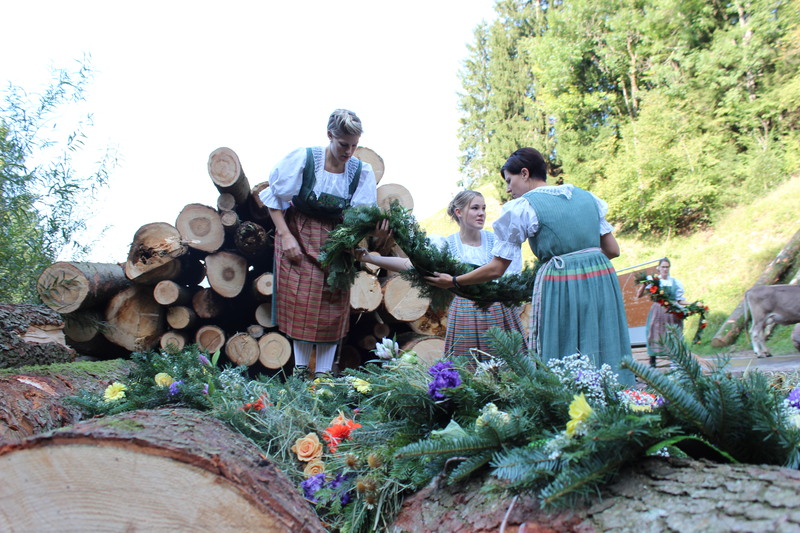 Later that evening, after sampling Älplermagronen (a Swiss pasta dish made by layering pasta and potatoes with cheese, topped with caramelized onions, and served with applesauce), the village was still buzzing with people enjoying a few beers. 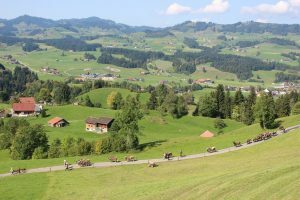 Before we headed back to our base in the smaller village of Entlebuch, the lead organiser was delighted to report that there were no incidents and that thanks to the sunny weather, they had a record attendance. 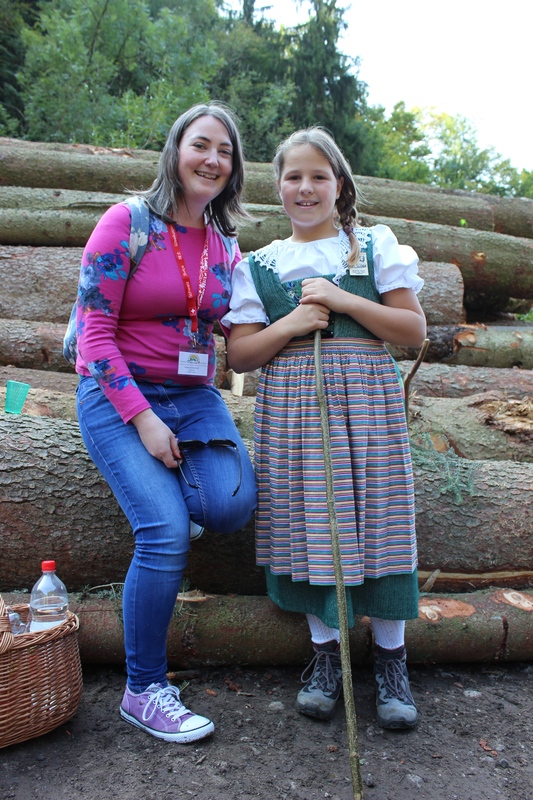 He also estimated that 570 hours were spent in preparing for the day – a great community event which attracted thousands of tourists considering Schüpfheim’s population is just under 4,000. It was an absolutely wonderful experience to witness this special festival seeing farmers and the general public celebrate the cow in such a colourful and musical fashion! 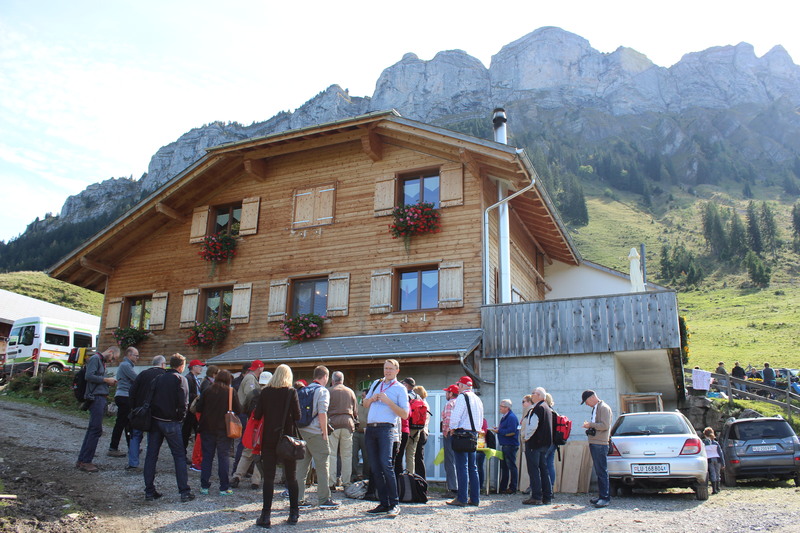 The press tour was kindly sponsored by the Federal Office of Agriculture, Swiss Farmers’ Union, Syngenta, Swiss Milk, Migros, LID, Micarnia, Nestle, Switzerland Cheese Making and Emmi. Many thanks to the organising committee and all their sponsors for their generous hospitality throughout the tour.